Affleck G, Tennen H, Rowe J.
Als H, Lawhon G, Duffy FH, e.a. American Academy of Pediatrics, Committee on Environmental Health. Chen XK, Wen SW, Krewski D, Fleming N, Yang Q, Walker MC. Davis L, Edwards H, Mohay H and Wollin J. Results of an observational program with synagis during the winter season 2001-2002 in Belgium. European Society of Paediatric Research Utrecht, 4-7 september 2002. Prediction of Spontaneous Preterm Birth. Evenson KR, Siega-Riz AM, Savitz DA, Leiferman JA, Thorp JM Jr. Vigorous leisure activity and pregnancy outcome. Epidemiology. 2002 Nov;13(6):653-9. Summary for 2000. Burlington: Vermont Oxford Network, 2002. Journal Pediatr 1998; 133:188 - 192. Palivizumab, a humanized respiratory syncytial virus monoclonal antibody, reduces hospitalization from respiratory syncytial virus infection in high-risk infants. Pediatrics 1998;102:531-7. Calculation difficulties in children of very low birthweight. Brain, 2001; 124 (9), 1701-1707. Environmental pollution and delivery outcome in southern Sweden: a study with central registries. Acta Paediatr 1996; 85:1361- 4. Increased risk of preterm delivery in areas with air pollution from a petroleum refinery plant in Taiwan. J Toxicol Environ Health 2001; 64:637-44. Meis PJ, Goldenberg RL, Mercer BM, e.a. Meyer MB Effects of maternal smoking and altitude on birthweight and gestation. In: Reed DM, Stanley FJ, eds. Miles MS, Carlson J, Funk SG. Den Ouden AL, Drykoningen CEM, Spee van der Wekke J, Sigmond-de Bruin EM, Verloove-Vanhorick SP. 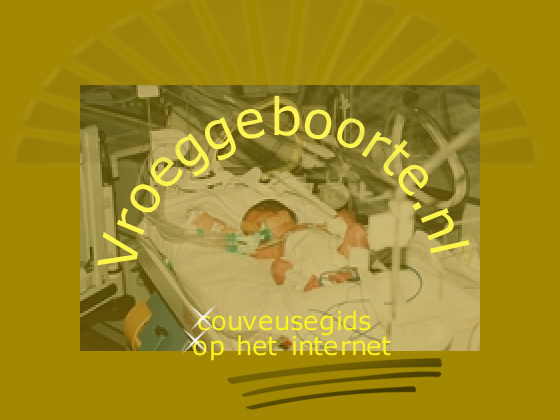 Reproductietoxische effecten bij ziekenhuispersoneel, Eindrpportage van onderzoek in opdracht van het Ministerie van Sociale Zaken en Werkgelegenheid, 1998. Redshaw ME, Harris A, Ingram JC. Incubator noise: A method to decrease decibels. Pediatric Nursing 1995; 21(3): 265-268. Retinopathy of prematurity: recent advances in our understanding. Br J Ophthalmol 2002; 86:696 - 700.